For us, homeschooling is a family affair. If we wish to have a successful school year, all five of us need to work together. My husband is the breadwinner and works outside our home to ensure we have the money we need to pay for books, supplies, and activities. I do the vast majority of the teaching, while our children are responsible for paying attention, working cooperatively, and completing their assignments. Though everyone has an important part to play in the homeschool family, there is one member of the homeschool family who may sometimes be left out of the loop: the father. Fathers are an important part of our homeschools, but because many are away at work during the day, it may take a bit of effort to actively involve fathers in the homeschool. Here are a few ideas we can use to help ensure fathers become active homeschool participants. The best way to help a father understand what’s going on in the family homeschool is to talk to him. Don’t assume he already knows and don’t assume he’s not interested in what’s going on. Each day, take time to talk to him about what’s happening in his homeschool and encourage your children to do the same. Let dad know what books his children are reading and make sure he’s aware of any new special interests his children develop. 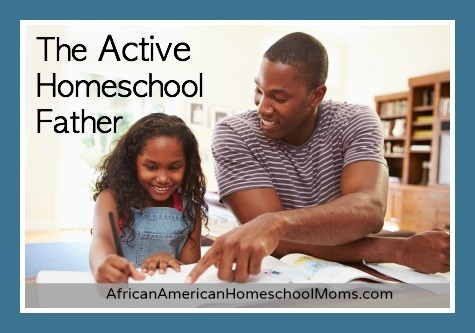 The active homeschool father can use this information to create meaningful conversations and connections with his children. Don’t plan the school year all by yourself. Invite your husband to join you as you sift through books, study curriculum, and consider activities. Tell him you value his opinion and seek it. Ask your husband his opinion on educational choices and see what he’d like his children to learn and do. As you work together to plan activities and opportunities for the coming year, assign tasks or set up checkpoints for both of you. This can help the homeschool father stay active all year long and his input may introduce opportunities and activities you’d not previously considered. Attend a homeschool convention together. The spring homeschool convention season is one of my favorite times of the year. The homeschool convention’s workshops and shopping opportunities are great, but I find if my husband accompanies me, the experience is much better. We spend quality time together, enjoy encouraging workshops (some even designed just for homeschool fathers! ), and have time to question curriculum providers together. The time we spend at the homeschool convention draws us closer together and keeps us stay on the same page. Create special projects for fathers to do with their children. Since many fathers are not able to teach daily, consider having Dad help his children with special projects outside the regular school day. This will become a special time of father/child bonding and will also provide a hands-on homeschooling opportunity the homeschool father can enjoy. 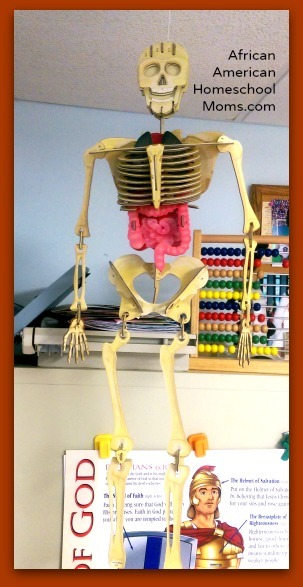 Earlier this school year, as I taught a detailed study of the human body and all its systems, my husband worked with our children to create the amazing skeletal model that now hangs in our schooling area. All of us loved it (and our friend Skelly looks great too!). Have him take children on field trips. The homeschool father may not be available to partake in daily homeschool lessons, but he may be able to take on extension activities. If you’ve spent a month studying marine animals, plan a “Day Out with Dad” trip to the aquarium or to the beach. These experiences will allow the homeschool father to bond with his children while reinforcing what you have taught. Be sure to schedule activities well in advance so your husband has time to make room for them in his schedule. The homeschool father is an important member of the homeschool family. If we fail to include him and neglect opportunities to involve him, our homeschools will not be as successful as they could be. Fathers can bring a fresh perspective and a new level of excitement to our homeschools. Let’s not miss this golden opportunity to solidify our family team, enhance our relationships, and improve our homeschools! I just wanted to say that we as homeschooling mothers need to be careful not to be dismissive of the fathers contribution to the homeschool as being the one to a lot of times carry the full financial load of the family. That is be “Active’ in our homeschool. Without that type of activeness a lot of us would not be afforded the opportunity to homeschool our children. Especially those moms who are SAHM’s as well. We also have to be careful with how we approach talking with our spouse about the day to day homeschooling. Be careful not to demand but to request. And also ladies need to make sure they realize Dad will not always teach from our predetermined lesson plans and that is OK. Let him contribute the way he wants to contribute. A lot of times we can be discouraging to a Dad that wants to be more involved in the day to day by making him feel like he is not doing it right. Think back to what you may have felt like on the days you were not “doing it right” and try not to make him feel like that. And at the end of the day if all he does is get up and go to work to financially support the homeschool then come home and maybe just ask the kids at dinner how their day was or maybe do a bedtime story do not forget to show him gratitude for that. Think about all hard work we do in homeschooling on the day to day that goes unrecognized and not praised. Don’t forget to give what you want to receive. I just wanted to put my two cents in on this in support of the Dad’s. They are “Active” in homeschool just by supporting the family. Moms don’t short change that contribution. I meet more and more homeschool parents everyday who are going it completely alone. And its hard hard work. Be grateful you have someone to share the load. Thanks for taking time to comment Erin. Your two cents is welcome here. As we homeschool, we certainly want fathers to feel engaged and we want to be sure we show appreciation for every contribution they make, taking care never to belittle or ignore it. Every homeschool is different, so a father’s contribution may vary by family. Homeschool moms should always make fathers feel that their contribution(s) are valuable no matter what shape or form they take. I am extremely thankful for the contributions my husband makes and your points are important reminders.